Do you have a family member or friend graduating this year? Here are some unique and fun gift ideas for every graduate, that will be clutter-free and useful. Make a check out for the year of their graduation, for example, $20.18. Do they own a vehicle? Gift cards for gas, oil changes, the car wash or a one-year membership to AAA. Are they music or book lovers? iTunes gift cards. Tickets to an upcoming concert or other performance. Are they in need of new two-wheeled transportation? A bike or bike accessories. Gift cards for movie theaters, restaurants or coffee shops. A Netflix or Amazon Prime membership for streaming movies. A laptop, headphones or a mini-charger for quick-charging their electronics. College-bound graduates may enjoy an Amazon gift card to use for textbooks or other essentials. Gift cards to stores that sell household and dorm room items or for their college bookstore. Spirit wear for the school they will be attending. A super practical, well-stocked first aid kit. Do you enjoy baking? Then an I.O.U. for fresh baked goods during finals would be something for the student to look forward to. A season pass for their college theater or a ticket to one of their college football games or another event. Grocery store gift cards for their college town. 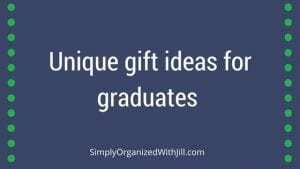 Comment below if you have some unique and useful gift ideas for graduates.